The best picture choice for 1949 makes for an interesting bookend to 1947's winner GENTLEMEN'S AGREEMENT. 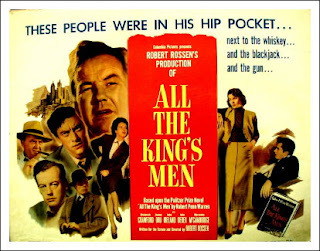 Just as the earlier film showed a postwar America riddled with bigotry and antisemitism, so ALL THE KING'S MEN portrays the modern American political system as one rife with corruption, where demagogic, power mad politicians rule with an iron hand and manipulate the voters like sheep. Although the film takes place in just one (unnamed) Southern state, clearly it is intended to represent the country's political scene as a whole, and, sadly, it is a portrayal that has not dated a bit. It is interesting to note that when John Wayne was offered the lead role by director Robert Rossen, Wayne angrily turned it down, claiming that the film was unpatriotic. Also, both Rossen and GENTLEMAN'S AGREEMENT director Elia Kazan would be called to testify at the House of UnAmerican Activities Committee as suspected Communists shortly after making these films. ALL THE KING'S MEN began life as a novel by Robert Penn Warren published in 1946 to much acclaim and a Pulitzer prize. It tells the tale of politician Willie Stark, who was loosely based on real life Louisiana governor Huey Long (the novel even ends with Stark's assassination at the state court house, which is the same way that Long died). Columbia Pictures bought the movie rights to the novel for $250,000 dollars, and hired Rossen to both write and direct. (Rossen had directed just two films before this, but he had been a screenwriter for years before becoming a director). Columbia reportedly wanted Spencer Tracy to play Stark, but Rossen chose Broderick Crawford, who, until this film, was mostly known for small character parts; Rossen had been impressed by Crawford when he saw him on stage as Lenny in OF MICE AND MEN, and eventually he persuaded the studio to hire Crawford, who was anxious to do the role. Another unusual decision by Rossen (one that was influenced by the neorealist films coming out of Italy around that time)was to shoot the film in an almost documentary style; many of the exteriors were shot in small towns in California and real townspeople were hired for small roles, and the crowd scenes often have the feeling of being more like a newsreel than a Hollywood film. Furthermore, even the interior scenes are set in real (or real looking) houses and offices, and Rossen and cinematographer Burnett Guffey avoided close ups of the actors and often stacked them together tightly in small rooms to build a sense of tension and conflict. The film opens with newspaper reporter Jack Burden (John Ireland) being sent to a small Southern town to cover the story of Willie Stark, known as "the last honest man." Willie is running for city council, hoping to reform what he sees as an unjust system, and Jack is taken with him and writes stories praising his bravery. Although he loses the election, Willie puts himself through law school and starts representing the causes of the poor people in the town. Eventually, he is picked to run as governor, but, he discovers that he was hired to split the "hick" vote and push the election towards another candidate. 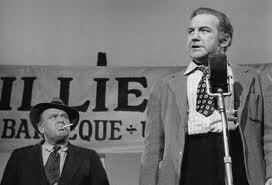 His anger over this causes him to drunkenly improvise an angry speech, and, in an electrifying scene, he calls the audience hicks, but then admits that he is one too ("nobody ever helped a hick but a hick himself".) The speech fires up the crowd, and even though he eventually loses the race, he is invigorated, saying that he now knows "how to win." Sure enough, he becomes governor in the next election, and he often rules the state more like a mob boss than a politician, using his power to force bills through the legislature. Even though he is shown doing some good, like building a new hospital, his administration is often outright criminal, at one point even murder is used to dispose of an unwanted adversary. Ironically, it is his personal life that causes his downfall, not his political one; right after barely beating an impeachment attempt over that murder (which, of course, could not be proven to be connected to Willie), he is shot and killed by the brother of a young woman that the married Willie had been running around with. With his bulldog like features, large frame and gruff voice, Broderick Crawford was an unlikely leading man, but he was perfect for the role and won an Oscar for it. It's really impossible to underplay a character like Willie Stark, and he certainly realized that! He is totally believable as he goes from honest crusader to corrupt politician, loving family man to womanizer and teetotaler to drunk. He is likable and admirable in the early scenes as he rails against injustice, and then equally despicable as he learns how to play politics and sells his soul for power, and Crawford really comes alive in the excellently written political speeches he makes in which he grandstands like a real politician. We really believe that he can connect with the common man, even if he himself is no longer one of them. 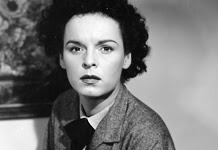 The film also has the debut performance of Mercedes McCambridge, who plays the secretary Sadie Burke, and who also won an Oscar for best supporting actress. With her deep voice and rough features, McCambridge is as unlikely a leading lady as Crawford was a leading man, but she is well cast as the smart, cynical Sadie and she would go on to play similar roles for the rest of her career. Although there is some sexism in the script's portrayal of Sadie's tough career woman leading Willie into the dark side of politics (she is the one who tells him that he's just a patsy in his first gubernatorial race, and then gets him drunk and seduces him, inspiring his angry, career making speech), McCambridge is so good in the role that we can't help but admire her ambition and drive. She also brings some tenderness to the role, as she really does fall for Willie, and she has a nice moment where she looks in the mirror and jealously admits that she is not like the glamor girl that Willie is currently running around with. The film's dark view of American politics is striking and uncompromising: when Willie defends himself by saying he's no worse than other men ("Man is conceived in sin and born in corruption. He passes from the stink of the dydie to the stench of the shroud.") it seems like a simple justification. But, later in the film, when faced with impeachment, Willie uncovers old, embarrassing information about an influential judge (Raymond Greenleaf) who, up until that moment, had been the personification of moral rectitude, in many ways proving Willie's point. While the judge may not be the outright crook that Willie is, he too has made moral compromises, the kind of compromises that, according to the film, all powerful people must make. Just how cynical about politics is this film? It's important to note that Willie first gets into politics with noble gains, and that he only becomes corrupt when he realizes that that is the only way to win; it isn't Willie that's corrupt, its the system itself that's corruptive. He's just a fast learner; from making sure to use tough guys to hand out his fliers, to visiting his estranged family for a good photo opportunity, to gathering his supporters to chant for him during his impeachment proceedings, he is a master of manipulation, getting the people's support as he gets away with murder. And even if Willie's reign of terror is ended with his death, there are surely more men like him waiting in the wings. If the film has a flaw, it is in the Jack Burden character, who's descent into corruption with Willie is not as convincing, or as compelling as Willie's. Every time the film moves away from Willie to Jack it bogs down, and Jack's sporadic narration of the film is unnecessary and uninteresting. Really, how could any other character be as interesting as Crawford's Willie Stark? SO DID THE ACADEMY GET IT RIGHT? Clearly, I consider this an excellent film and a worthy (and bold) choice for best picture. Although the year also gave us such good films as A LETTER TO THREE WIVES, THE HEIRESS and ON THE TOWN, I think ALL THE KING'S MEN was a fine choice.